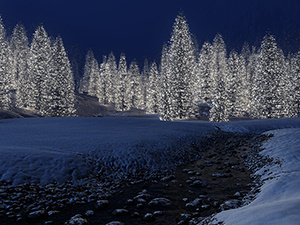 "Snowy Creek Christmas -- Christmas 2006"
I've been experimenting a lot with underwater lighting recently and this piece (from 2009) seemed like a good candidate for an upgrade. I absolutely love this one. Serene, yet slightly alien in terms of the colors of much of the flora. I did notice, however, there appears to be a black sphere / circle on the left hand side of the dual screen near the bottom of the image. It's hard to describe how happy I am to see this. I always thought the new Oasis Night had potential, but the strong yellow/brown colors, and complete lack of front-lighting, ruined it for me. Then, out of nowhere, THIS shows up. For years I've needed more centerpiece pictures I can legitimately frame at large size (34" width) and have them look amazing. This, along with Shaded Path, is a HUGE part of the answer. KEEP. IT. UP!!! The Moon is right an the lighting from under the water gives an ethereal glow that begs the imagination to want to submerse oneself into the pool, for the doorway to Atlantis. This is really nice, very warm feeling. I love it to death, definitely my most favorite types of images that you do . The only thing that prevents this from being a 10 for me is because there is something about the lower half of the image that looks like it was compressed or like the image quality was somehow compromised. It might just be because there is so much going on in that section. But yeah, it is gorgeous. I like the blue more than the green version, too. Thank you! I see this one as a very pleasing blend of tranquility with a just-so light dashes of fantasy and hyper-reality. Nicely done. These images keep me coming back. Thank you Ryan. "There's a little black spot on the ..."
I just grabbed a copy of Moonlit Oasis, dual screen, and when I put it up as my new wallpaper I saw a sizable black spot in it. It's located just to the left of what would be the left border of the single screen version. Just left of the third (frontal) tree, almost under the fourth tree, and above a flower. Hope that description helps. I've also looked at "all" the dual and triple screen versions, and yep it's on every one of them. Top marks for me. I love this. Great update to a beautiful work. I would rate it higher, but I think that the palm trees look somewhat scaly and not as photo-realistic as a lot of your work. Both the green and blue renders are gorgeous, and I prefer the blue. I also want to point out that there is a glitch in the multiscreen version: a circular void just above the shoreline about a third from the left edge. I like both, but the blue version is really special. the colors are just amazing. I like the original Oasis, but this is even better! Will there be a dual screen render to this soon? I gave these a 10. Amazing! But, If I have to choose.. I like the 1st green one the best and it is still on my desktop. Even though the blue one has some nice, additional illumination in the trees, I think the green is more striking and, to me, actually looks more like someone's first-person view of walking through the area at night with a lantern. It's my favorite part of the image. Thank you, Ryan! Very beautiful. Evocative works are just easier to look at. Is there a 720 x 1280 version on the way? I've added a second version to the Members Gallery this morning. 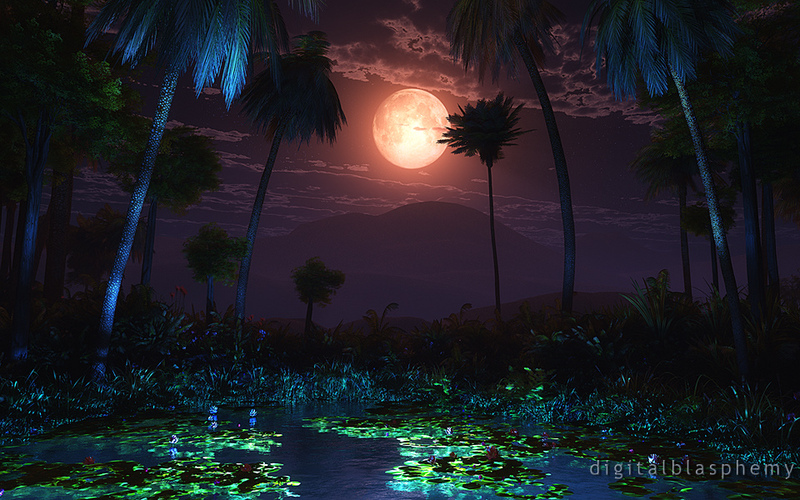 I've made the water blue (to match the light cast on the trees) and added a bit more illumination. The first version will remain available in the Pickle Jar. Which render do you prefer? Because the only thing that'd make this better is better trees. Otherwise, this is an *awesome* pic. So much better than the original oasis that words originally failed me. I like everything about this but the palm trees. This is glorious and enchanting. This one's going on my desktop AND my phone! So beautiful! I love the color contrast between the sky and the water. Wonderful job!!! I absoluetly love this one!! 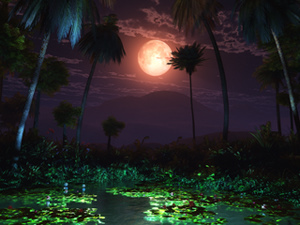 Love the color of the moon the way it appears to light up the water. Ryan you never disappoint!! The foreground was basically invisible in the first one because it was so dark. I didn't realize there was SO MUCH going on in it! The foreground on this one was so dark before... nice update! I like the lighting and the moon in this. Very nice. This is simply a beautiful scene. Great work.